Okayama Prefecture, located in the western part of Japan, is still an area missed by most foreign tourists. Unfortunately, because there are so many great spots to explore. I want to introduce some to you with this post. Depending on where you are starting your trip, there are several ways to get to Okayama Prefecture. One is using the Shinkansen (or any other train) to get to Okayama City. For sure, there are also highway busses going there. Another convenient way is using an airplane, going to Okayama Momotaro Airport. I wrote a detailed article about it earlier here. This is also the way I used for my round-trip from Tokyo Haneda Airport. We had a relaxed flight with Japan Airlines (JAL), lasting about one hour and costing a bit less than the Shinkansen ticket. Getting around in Okayama Prefecture can be a bit tricky, especially when using public transportation. Sure, there are trains going to the more popular places, but for others you have to use local busses or even a taxi. I recommended using a rental car, especially for the more hidden spots. Okayama City is one of the main attractions of the prefecture. There you have the beautiful Korakuen (後楽園), which belongs to the Three Great Gardens of Japan and is totally worth a stroll around. 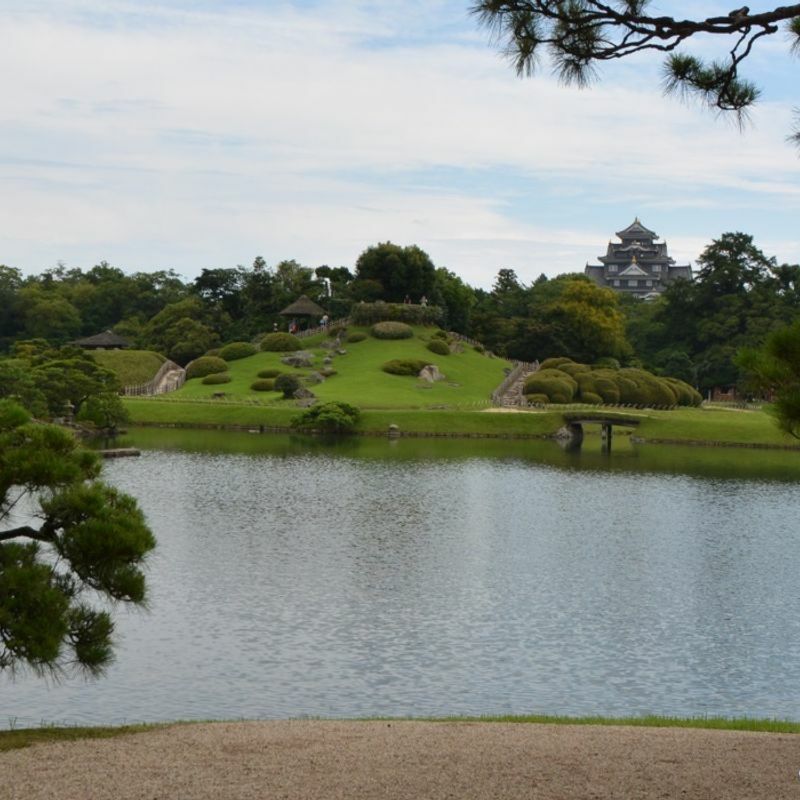 From there you can also see another nice spot: Okayama Castle (岡山城). The castle is also known as “crow castle”, because of its black color. Unfortunately the original building was destroyed during World War 2, but the reconstruction is nice too. Leaving Okayama City you easily can get to Kurashiki (倉敷) which I totally fell in love with. I especially liked the Bikan Historical Area with the canal and the original architecture. You can rent denim kimono there, which is unique to this area, and there are a lot of great shops and restaurants to stop by. 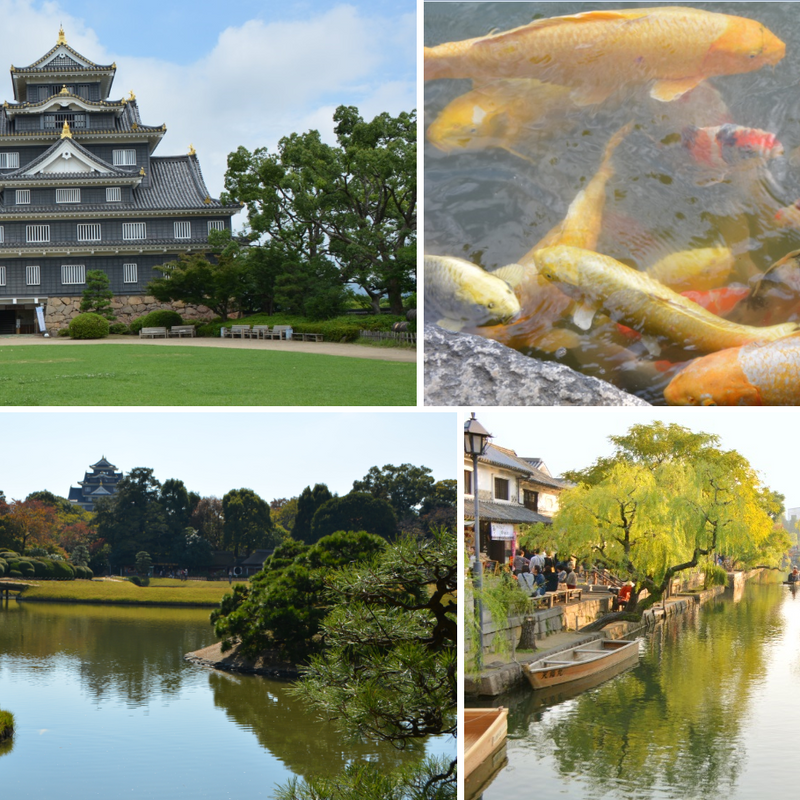 Heading to the north you can find Takahashi City which is mainly famous for its castle. Bitchu Matsuyama Castle (備中松山城) is also called Castle in the Sky because it is located on top of a mountain and when the morning mist is rising up it looks like it is floating in the clouds. If you drive further into the mountains you should stop by Fukiya Furusato Village (吹屋ふるさと村), a small village with a special charm. The place is known for bengara color. Many houses are painted with it such as other things like clothes, dishes and more. Another great area is Hiruzen Highland (蒜山高原). The plateau is great for a bicycle ride to see the beautiful wide landscape. Also in winter it has some nice winter sport resorts. We stopped by the Hiruzen Winery where they use local mountain grapes to produce not only wine, but also juice. Let’s round up the northern area with Okutsukei Valley (奥津渓) which allows you to see some amazing scenery. We visited during the autumn foliage and were impressed by the light up in the night. 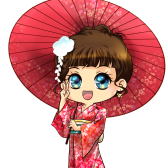 Furthermore they have nice onsen there. You should definitely spend a night at Meisen Kagiyu Okutsuso (名泉鍵湯 奥津荘), a great ryokan with history. Time to go to the south. On our trip we stopped by a city called Inbe (伊部) to get to know the famous Bizen-yaki (備前焼), a type of Japanese pottery. 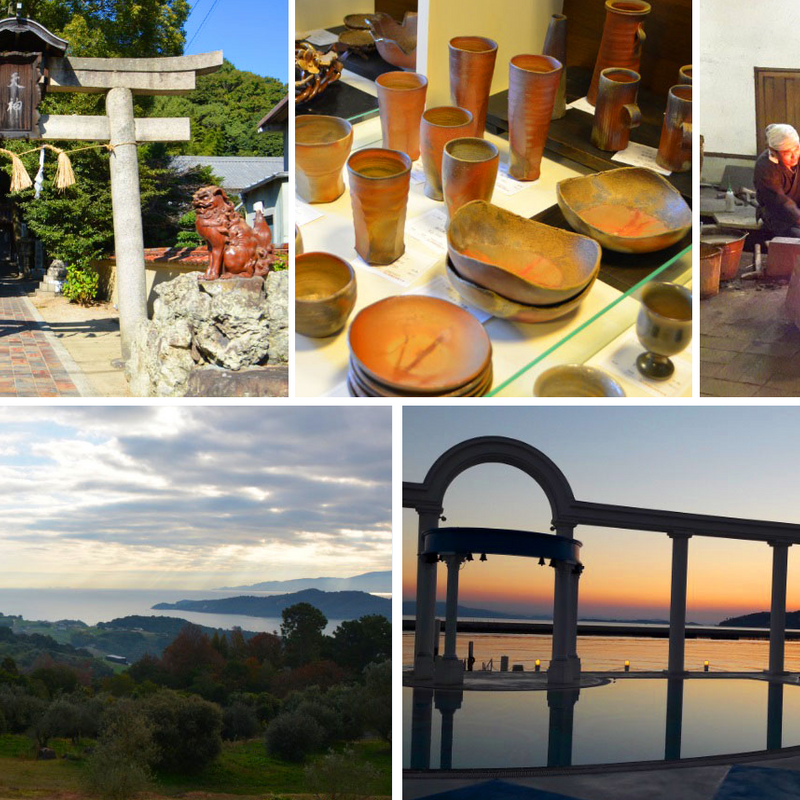 In this area you can find a museum, a shrine filled with bizen-yaki, and even take part at workshops to create your own pottery. Another great place in southern Okayama which you should visit if you are interested in Japanese swords is the Osafune Japanese Sword Museum (備前長船刀剣博物館). There you not only can see swords in the museum and learn about the history – you can also see how the swords are produced! Last but not least, there is the Seto Inland Sea (瀬戸内海). We visited Ushimado with the small harbor, an olive garden with a great view over the small islands – and Greek charm. Staying at Hotel Limani with a Greek atmosphere, you really could think about a short trip to Europe. 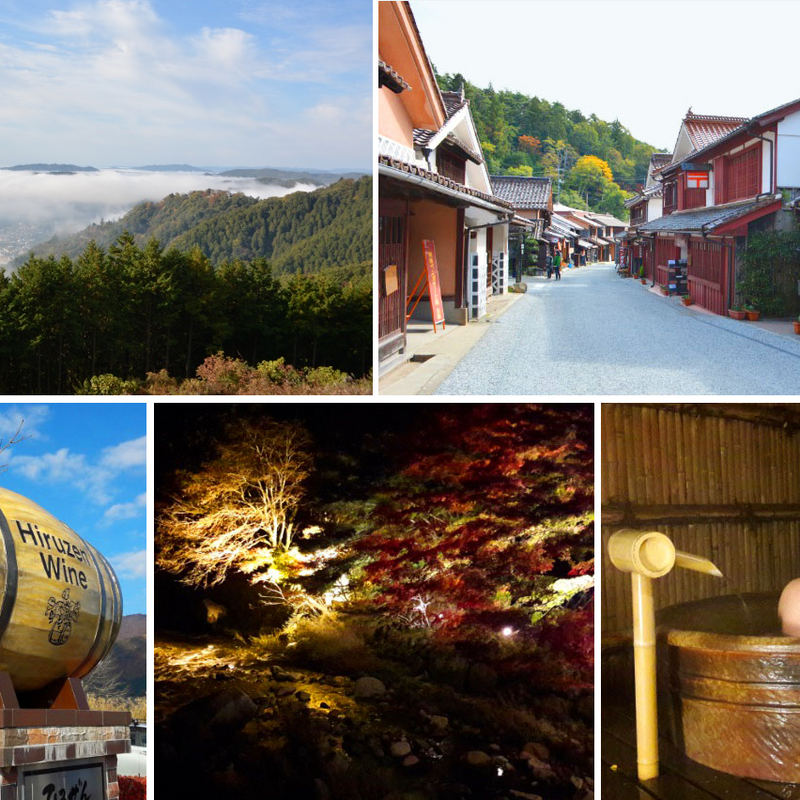 There are a lot of great places to explore in Okayama and I hope I could give you a small idea what to do there. Are you ready for your trip? Welcome to Okayama Momotaro Airport! 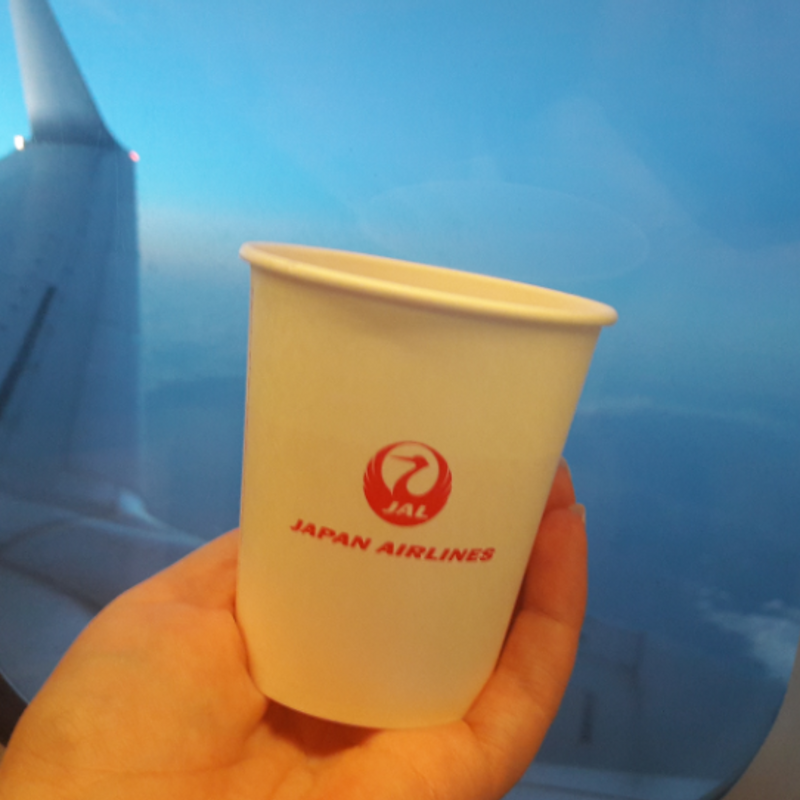 This post is supported by Japan Airlines (JAL), one of City-Cost's Supporters helping City-Cost bloggers to enjoy life in Japan and engage in new experiences.